NEW YORK, NY--(NEW YORK, NY--(March 27, 2018) - Algodon Wines & Luxury Development Group, Inc. (OTCQB: VINO), Inc. (OTCQB: VINO), a real estate development brand with luxury lifestyle assets and premium wines in Argentina, today announced that Algodon Mansion has been featured in an article by Huffington Post. The article, A Luxury Stay in Buenos Aires| Five Hotels, Five Personalities, provides an overview of five luxury hotels in the city that “embody the breadth and diversity of options for accommodations in contemporary Buenos Aires.” The five hotels include: Algodon Mansion, Palacia Duhau - Park Hyatt Buenos Aires, Faena Buenos Aires, Hotel Club Frances, and Alvear Palace. NEW YORK, NY--(Marketwired - August 24, 2017) - Algodon Wines & Luxury Development Group, Inc. (OTCQB: VINO), a real estate development brand with luxury lifestyle assets and premium wines in Argentina, has completed the strategic acquisition of additional land directly adjacent to the existing Algodon property. The new parcel measures 845 hectares or 2,088 acres, more than doubling the size of Algodon Wine Estates. French classical design with a modern twist, all housed inside a historical building, this Recoleta gem offers impeccable service, great dining, and plenty of wine. 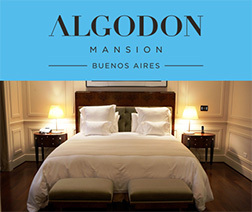 The first stop on my hotel tour of Buenos Aires was the Algodon Mansion. This classic French-styled landmark property dates to 1912 and is situated in the heart of the peaceful and historic Recoleta neighborhood. While the common spaces of the mansion are cozy, the contrasting spaciousness of all of the individual suites is what really distinguishes this boutique property. 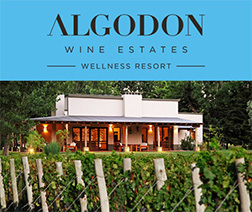 NEW YORK, NY -- (Marketwired) -- 10/19/16 -- Algodon Wines & Luxury Development Group, Inc. (OTCQB: VINO), a real estate development brand with luxury lifestyle assets and premium wines in Argentina, has been awarded a gold medal in the Global Malbec Masters 2016 Wine Competition for its 2012 Black Label Malbec. 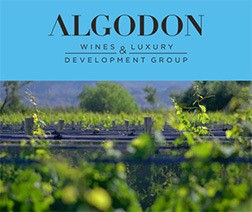 NEW YORK, NY – October 13, 2016 – Algodon Wines & Luxury Development Group, Inc. (OTCQB: VINO), an emerging luxury brand and luxury real estate developer, has selected Ginevra Sotheby's International Realty to provide sales representation for the company's luxury residential development in the San Rafael, Mendoza wine region of Argentina. Algodon Group's collection of luxury assets currently includes Algodon Fine Wines, Algodon Wine Estates, Algodon Wine & Wellness Resort, Algodon Mansion, and Algodon Extra Virgin Olive Oil. Honeymoon worthy and full of Argentine charm, this Recoleta hideaway has only ten rooms, so you're likely to have the rooftop jacuzzi and plunge pool to yourself. Every room is massive and comes with butler service, while bathrooms have steam showers and soaking tubs built for two. Seriously, this is baby-making territory. 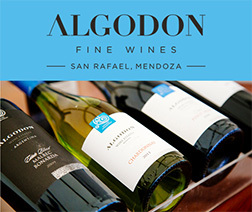 Tip: Algodon’s sister property in Mendoza creates incredible wines, all available at the hotel. Sign up for a tasting with the in-house sommelier then ship home a couple cases to relive your weekend en casa.